Everyone knows about Santa! You don’t even have to celebrate Christmas to know about Santa and his jolly belly that shakes like a bowl full of jelly! You know he flies in a magical sleigh and delivers presents to all the girls and boys of the world. But I am willing to bet that you don’t know about Santa’s little secret. And I’m not talking about elves, either. No, I’m talking about the darker side of the holiday. The less festive. The scary secret that no one likes to talk about, or if they do it’s in hushed tones long after the kids have gone to bed. That’s right. Santa has a dark side, ladies and gentlemen, and it ain’t pretty. We all know that the good girls and boys get lots of presents from good ol’ St. Nick on Christmas Day, but what happens to the bad ones? Well, I’ll tell you. They get snatched up or smacked with a rod by the darker side of Christmas. You may call them Krampus or Belsnickel or Le Père Fouettard…but I call it comeuppance! These dark companions travel with St. Nick (aka, Father Christmas, Santa Claus) and carry a rod or a stick and a bag. They’re often dressed in rags and have horrible, scary faces or they can be dark, sinister versions of Santa himself. Regardless of what they look like, their purpose is to punish and discipline the kids who have been bad throughout the year. The most famous of these companions is Krampus. 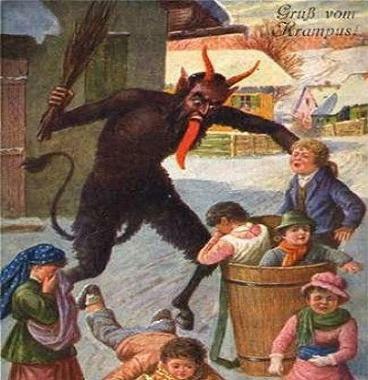 The story of Krampus dates back to pre-Christian Germanic traditions, and is often found in the areas of Austria, Bavaria, Croatia, Slovenia, Hungary, Switzerland, and Pennsylvania (I know, right? But there’s a huge Germanic population there, that’s why.) Typically, Krampus carries chains and birch branches that he uses to swat at kids. Sometimes – and here’s the dark part – he carries a bag or a washtub on his back to cart off bad kids to drown, eat or transport to h-e-double-hockey-sticks. The name Krampus comes from the Old German word for ‘claw,’ and you better believe he has them! He’s been described as looking like a demon with long horns and goat-like features. Sometimes he has razor sharp teeth and a long, forked tongue. No matter how you slice it, Krampus is scary. Then you have good old Belsnickel. 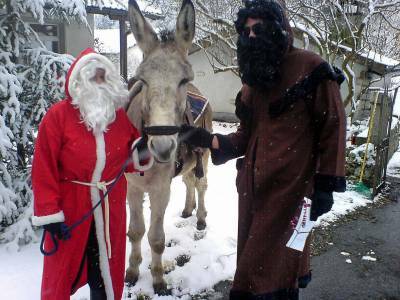 He can be found running around the northwestern parts of Germany at Christmas time with his good friend Sinterklaus. In fact, Belsnickel shares many of the same characteristics as Krampus but isn’t as scary. But, compared to Krampus, he seems like a nice guy! He’ll even deliver socks or shoes full of candy to children who have behaved, but if you’ve been bad, well, Belsnickel will give you a bunch of coal or a switch. Sometimes, he’ll even let the bad kids sing a song or tell a poem in order to change his mind. At least he has a nicer side, unlike this next “friend” of Santa. All joking aside, these stories have been passed down in many variations throughout history as a way to make sure those young girls and boys would mind their parents. Getting kids to behave is hard work, and it’s our job as parents to use horrific imagery to frighten them into good behavior right? Maybe not. All I know is that when I’m setting out my plate of cookies and glass of milk for merry ol’ St. Nick, I’m taking one look over my shoulder to make sure one of his darker companions isn’t lurking in the shadows waiting to eat me, beat me or whip me for misbehaving!